I first saw the movie Jurassic Park as a high school student when it was released 20 years ago. At the time it led to a sudden rise in the number of children obsessed with dinosaurs and wanting to be palaeontologists. But for me it was all about the scientists working away in the laboratory extracting dinosaur DNA from the stomachs of blood-sucking mosquitoes that had been entombed in amber for millions of years. I suspect that this movie was where my fascination with ancient DNA started. Re-watching the movie last week, with hopefully more knowledge of molecular biology than my high school self, I was interested to see how the science stacked up twenty years later. Early Miocene mosquito from the Dominican Republic. Photo by Didier Desouens. Around the time that Jurassic Park was released a number of scientific studies were published claiming to have obtained DNA from amber-entombed insects that were many millions of years old. None of these results have been able to be replicated under controlled conditions and many have since been shown to be the result of contamination from human or bacterial DNA. Although amber (fossil tree sap) is an excellent medium for preserving the morphological structure of insects and other organisms, such as plants, frogs and lizards, it seems that it is not conducive to preserving the fragile molecules of DNA. So if we can’t get DNA from insects in amber, can we get it from dinosaur bones or eggs? In 2000 scientists announced that they had sequenced small pieces of DNA from a 65 million year old Triceratops bone and that the DNA sequence they obtained was identical to turkey DNA. This result was surprising because not even other bird species have a 100% match to turkey for this fragment of DNA. The most likely explanation for their result is that the DNA sequence they obtained was actually turkey DNA. The scientists, who remained quite sceptical of their own findings, later admitted that they may have been eating turkey sandwiches in the laboratory, which was probably the source of the contamination. Fossil Iguanodon Tooth, about 132-137 million years ago, Cuckfield. Gift of the Mantell Family, 1930. Te Papa. This fossil from Te Papa’s collection was the first fossil to ever be recognised as a dinosaur. So how long does DNA last? Experiments using bones from New Zealand’s own moa have shown that under ideal conditions (dry and cold environments such as Arctic permafrost), DNA would be completely destroyed after 6.8 million years. The age limit to being able to retrieve readable DNA is likely to be about 1 million years. This is much more recent that the youngest dinosaur remains at 65 million years old (excluding the ancestors of modern birds). Currently the oldest accepted ancient DNA recovered is 700 000 years from a horse bone preserved in permafrost in Western Canada. There are numerous websites discussing other scientific inaccuracies in the movie. For example the pack-hunting Velociraptors shown in the movie are another genus of dinosaur, Deinonychus. Velociraptors were actually about half the size of those in the film. 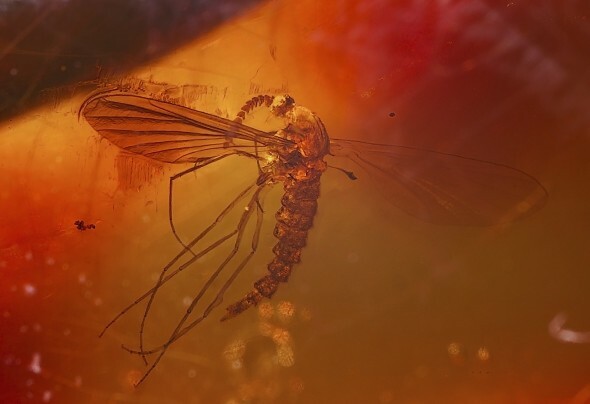 Recently an entomologist pointed out that the specimen of mosquito shown in amber in Jurassic Park is an elephant mosquito, which is one of the few species that doesn’t actually consume blood! It is the largest species of mosquito, which is probably why it was selected for the movie. Despite a few scientific errors, and after all it is science fiction, Jurassic Park remains a classic. Jurassic Park IV, which isn’t set for release until 2015, is already riling paleontologists who were hoping that some of the dinosaurs would be feathered, reflecting recent research. And what about Mary Schweitzer discoveries? In 2011 she has found traces of aDNA in Tyrannosaurus rex cells. And before – collagen, hemoglobin and other proteins. All where expected to be just bacterial contaminations – unless proven different: they’re original. So I wouldn’t be so sure that the DNA isn’t. Thank you for your comment. Mary and colleagues have published a number of papers reporting proten survival in dinosaur bones. Proteins are known to survive much longer than DNA but I believe that Mary’s research still has many critics and is quite controversial. It will be interesting to see what happens in the next few years!